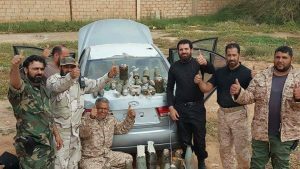 The commander of the Libyan National Army’s Saiqa Special Forces reportedly escaped a car bombing in Benghazi today when an explosives-laden vehicle was spotted and made harmless. The silver Hyundai Sonata saloon without registration plates and with a rather poor paint job was apparently found near the route that Colonel Wanis Bukhamada was taking to attend the funeral of Saleh Jouda, the pilot whose Mig-21 crashed into a Tobruk house today. According to Saiqa information officer Riyad Al-Shuhibi, the explosives in the vehicle were hard to detect and had been rigged sophisticatedly. Although Shuhibi did not say it, the detonation would have been made remotely, presumably as Bukhamada’s convoy passed by. A video of engineers making the car bomb safe showed them pulling a radio unit and antenna from inside the dashboard. However, the video also showed that the car had been left on rough ground between a two-storey building and a high wall, with no sign of a nearby road down which Bukhamada’s convoy would have passed. Given the amount of artillery and mortar shells that LNA engineers were filmed taking out of the vehicle and casually piling some distance away from it, it is clear that had it been detonated the explosion would have been considerable. Two months ago, another Saiqa Special forces commander, Colonel Mahmoud Al-Warfali, who has since been implicated in war crimes, survived a car bomb attack in Gwarsha as his convoy passed a petrol station on its way to the then-besieged militant enclave of Ganfouda. Saiqa sources are saying that today’s planned car bombing may have been in response to the final reduction of the 12 Buildings complex after a siege of almost five weeks. The Saiqa information officer did not given the location of the vehicle but sources have suggested that it was near Benina.